Last week, I spent a glorious few days in Calgary, visiting my boyfriend who is there on a temporary assignment. It proved a much-needed reprieve from the Houston heat (and floods) and we spent lots of time hiking, exploring, and eating (duh). One of my favorite dishes was at a restaurant called Ox and Angela, which served (sort of) traditional Spanish tapas and reminded me of all of the tapas consumed when I studied in Cordoba, Spain during my junior year of college. The dish was a simple salad of zucchini, studded with Marcona almonds and garnished with shaved Manchego cheese (two of my favorite things in the world that happen to also be very Spanish). We devoured it immediately and I vowed to recreate it the second I got home. Zucchini makes a lovely grain-free substitute for pasta, but its texture can sometimes be a little bit off-putting when served completely raw. By marinating the zucchini in lemon juice and olive oil, it softens and gains a more “cooked” texture that is much more appetizing. You can use a mandoline slicer to cut your zucchini ribbons, or just use a vegetable peeler and run it down the length of the zucchini until you reach the core. My favorite mandoline is this little cheapie from Sur la Table that I use far more often than the expensive one I have with a gazillion different blades that is most certain to slice off a finger one of these days. Once you marinate the zucchini, this salad comes together very quickly and should be eaten day of or it will get too soggy. I imagine this would go nicely with some torn prosciutto and basil if you wanted a more Italian take! Using your mandoline or vegetable peeler, slice the zucchini into long ribbons, keeping them as uniform in size as possible. Place the ribbons in a medium bowl and add the lemon juice and olive oil. Toss to coat and let stand 30 minutes to 1 hour, until zucchini begins to soften. Be careful not to leave marinating too long, as the zucchini will become mushy. 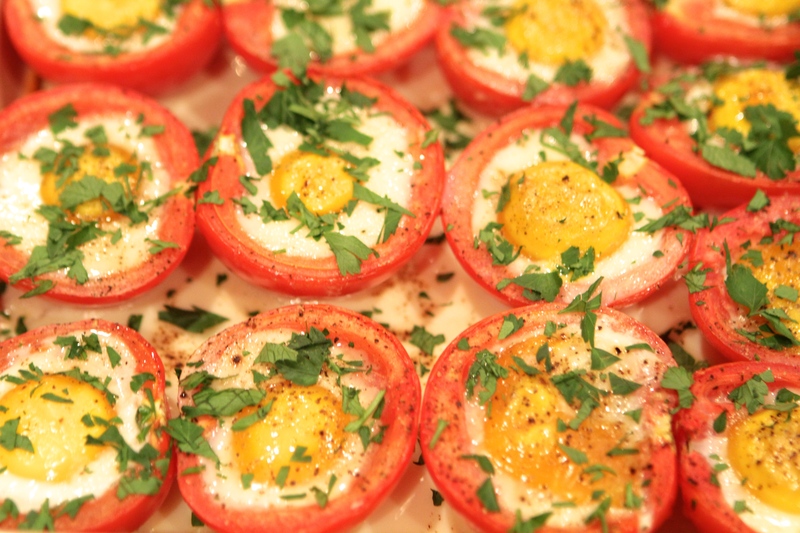 Add the almonds, tomatoes, cheese crumbles and fresh mint leaves. Sprinkle with the sea salt and serve at once. Smoothie bowls are a great way to change up your morning routine. By using a little more frozen fruit and a little less liquid, you get a texture that is closer to ice cream..and who doesn’t like ice cream for breakfast?! I was obsessed with acai bowls when we were in Brazil earlier this year, they were like, one of two foods I actually ate while I was there. In case you didn’t read that rant, see my Moqueca Fish Stew post from awhile back. Sadly, the acai I have found in the states so far really doesn’t compare. There is a frozen version and a powder at Whole Foods. Don’t get me wrong, they’re not bad, just not the real deal. I mixed in some frozen blueberries to amp up the purple color and berry flavor. You can do this with literally any frozen fruit, any milk or nut milk, and any combination of toppings. Blend all ingredients in a high speed blender until smooth, adding more frozen fruit or liquid until a thick consistency is achieved. Pour into a bowl. 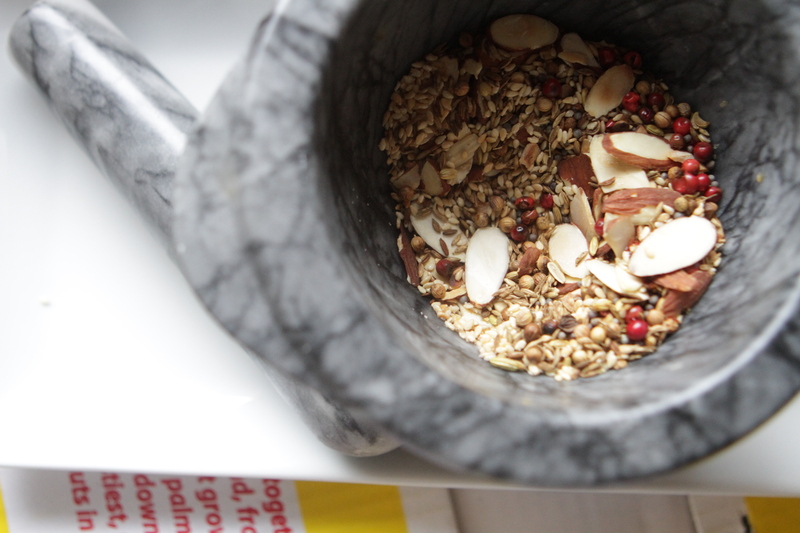 Top with shredded coconut, goji berries, hemp seeds, bee pollen or superfood add ins of your choice! The options are endless! 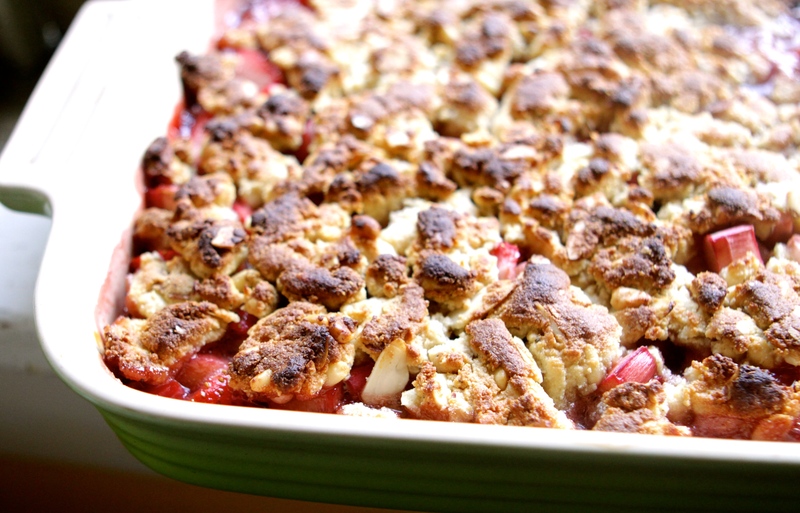 I can’t tell you how thrilled I was to come across rhubarb at my local Whole Foods the other day. We used to have this growing in the backyard on the East Coast, but it is very rare in my experience to find fresh rhubarb anywhere in Houston. My grandmother, Dot, who is my culinary idol and would be 99 years old this month, used to make strawberry rhubarb pie in the summer. We would have a picnic under her carport nearly every Sunday, and her desserts were always the best part. I’m pretty sure the woman subsisted entirely on sugar for the last 10 years of her life, all 98 pounds of her! Needless to say, I scooped up several pounds of the bright red stalks and the cashier looked at me, dumbfounded and had to look it up. 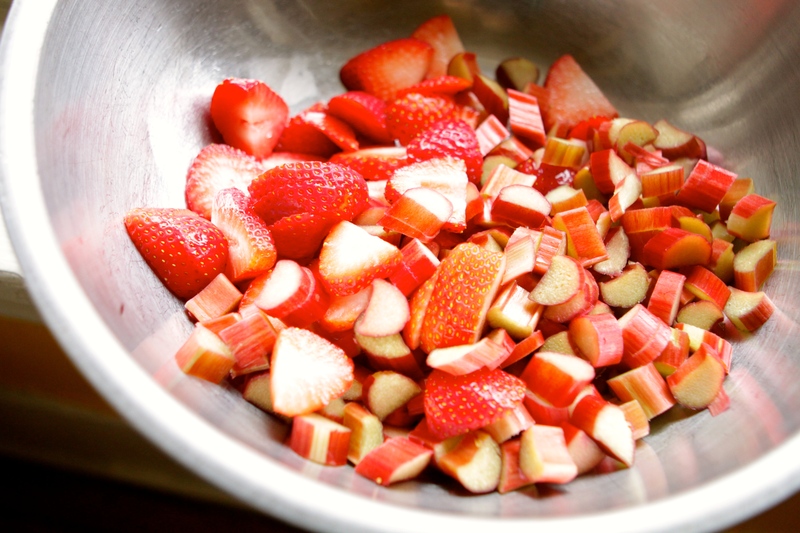 As soon as I got home, I got to work chopping the rhubarb into small pieces, freezing a good amount to stash away. I’m not sure my grandmother would recognize the final product, or approve of the lack of actual sugar, but the idea is the same. 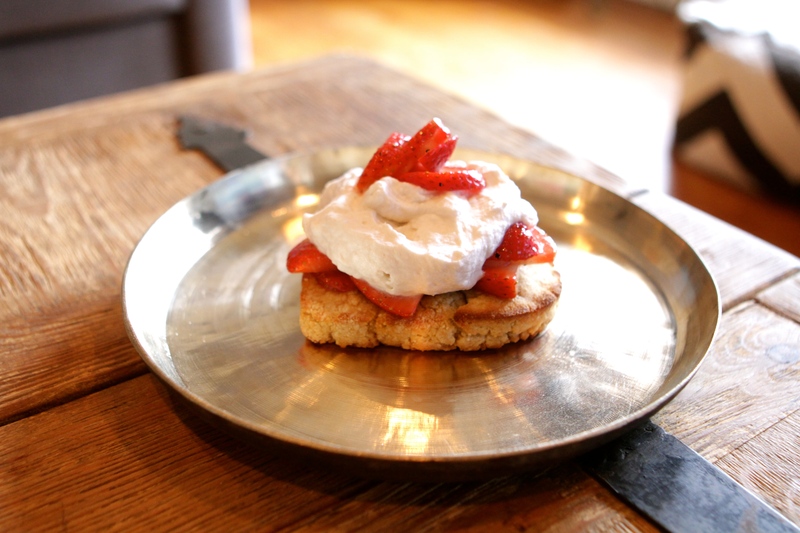 Tart rhubarb and sweet strawberries are a match made in heaven. 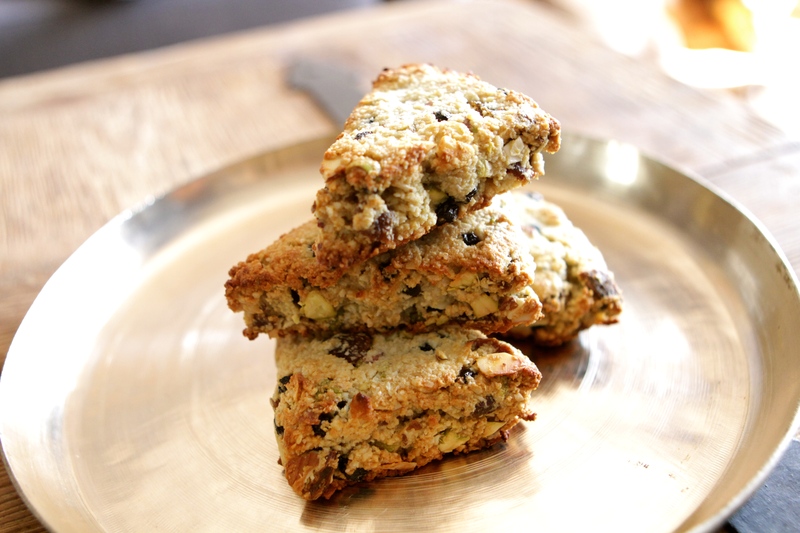 I jazz them up with a bit of lemon zest, red wine and black pepper and top it with an almond flour and pine nut crumble. This dessert is best eaten warm with a scoop of ice cream (try this coconut milk version) and shared with friends. Preheat the oven to 350 degrees. Grease an 8 x 8 pan or skillet. 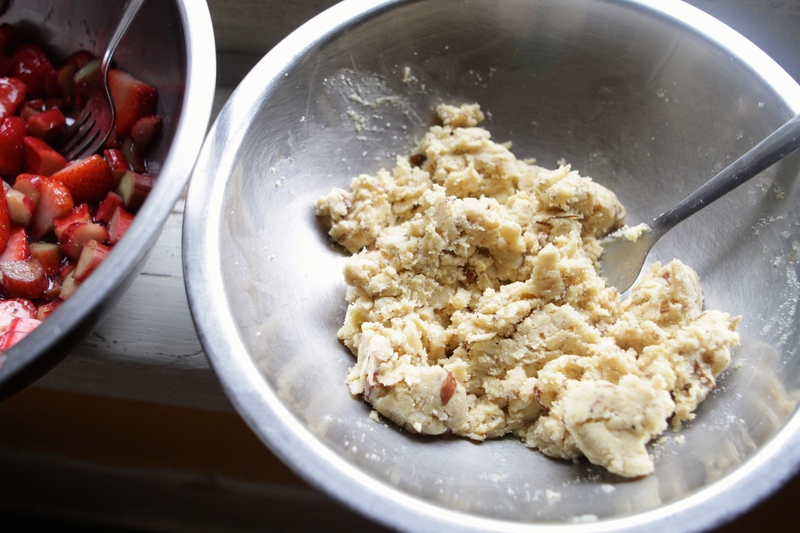 Assemble the filling by combining strawberries through honey. Mix the arrowroot with the red wine until it is completely dissolved. Add into the filling mixture and toss to coat. Set aside. 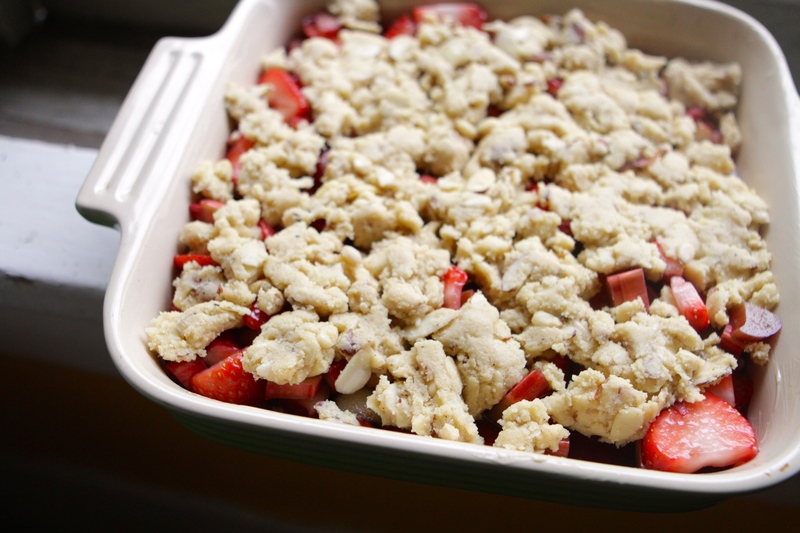 Make the crumble. Combine the flours, nuts, salt and pepper. Add the honey and the butter and use a fork to cut into the flour mixture until crumbs form. Keep pressing together until you have a workable dough. Pour the filling into the pan. Crumble the topping over filling. Bake for 25-30 minutes until topping is browned and filling is bubbling. Remove from the oven and serve warm. I’m a big fan of the Farmhouse Culture Ginger Beet Sauerkraut, and like most store-bought things, I tell myself that “I could SO make this at home” every time I buy it. So, I did. I added a little bit of my own flair with garlic and jalapeños, and after a couple weeks on the counter, I’m pretty darn pleased with the result. 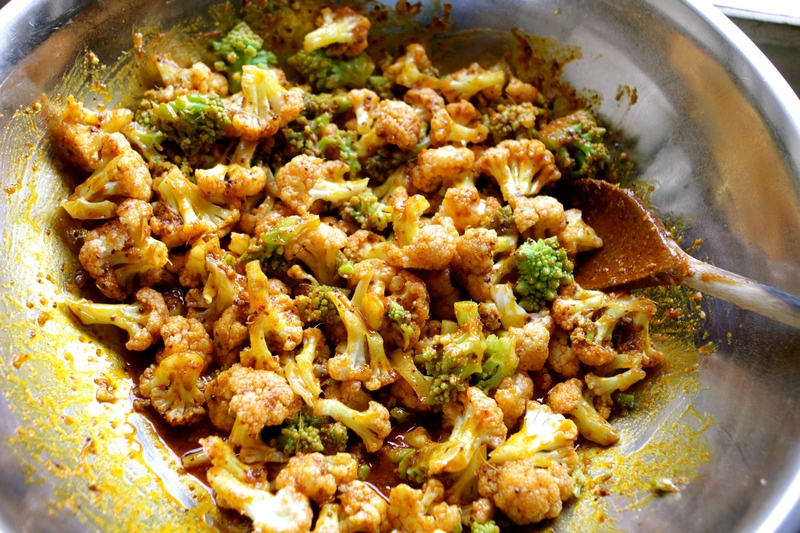 I love cultured veggies with just about everything–pop this on top of salads, serve as a side dish or condiment! 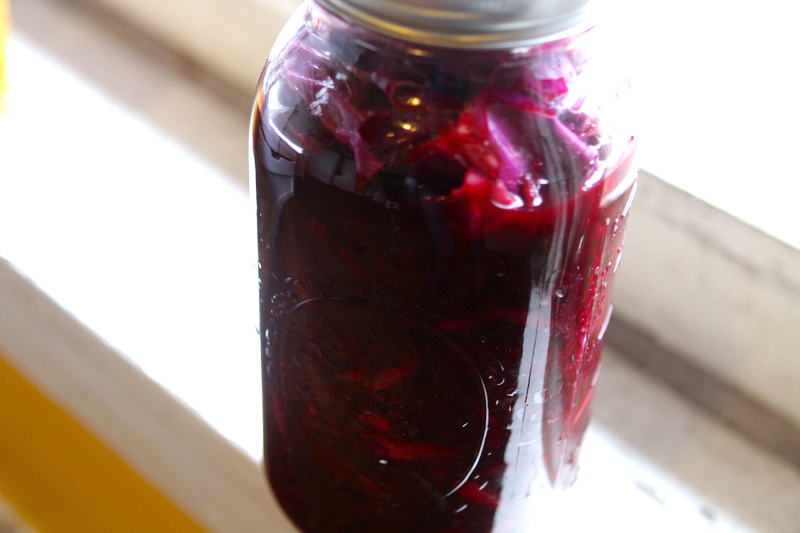 The bright purple color from the beets and red cabbage is totally gorgeous, to boot! 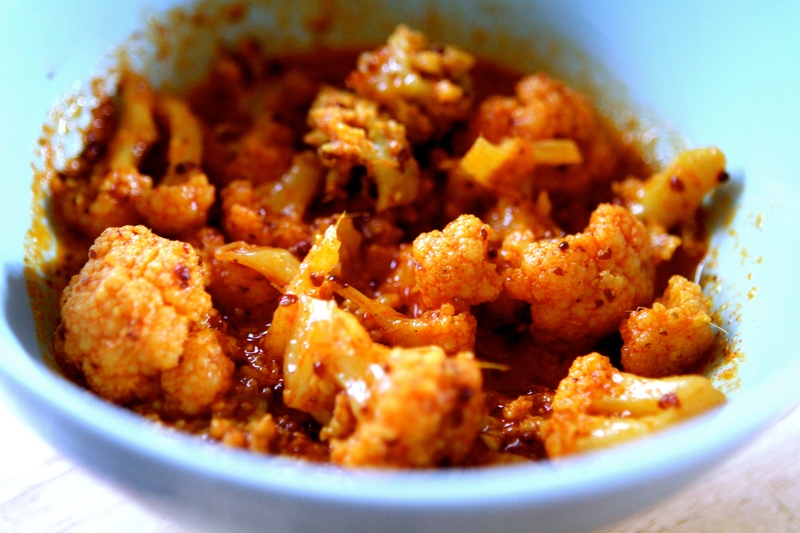 Cultured veggies are packed with probiotics to promote a healthy gut, aiding in digestion and immune function! The ginger, garlic and jalapeños add a powerful immune boost as well and aid in circulation. Lacto-fermentation is an easy way to make your own probiotic superfoods and store foods for an extended period of time! 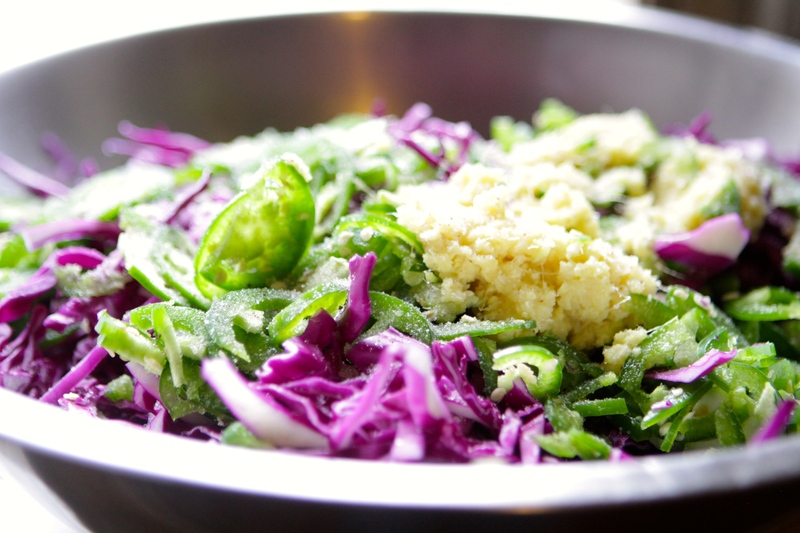 Toss together the cabbage, beets, garlic, jalapeños, ginger and sea salt in a large mixing bowl. Knead the mixture together until juices begin to release, about 5-7 minutes. You may want to wear gloves for this step! Allow to rest for a few minutes, then knead for another 5-7 minutes. Pack the mixture into a liter sized mason jar. 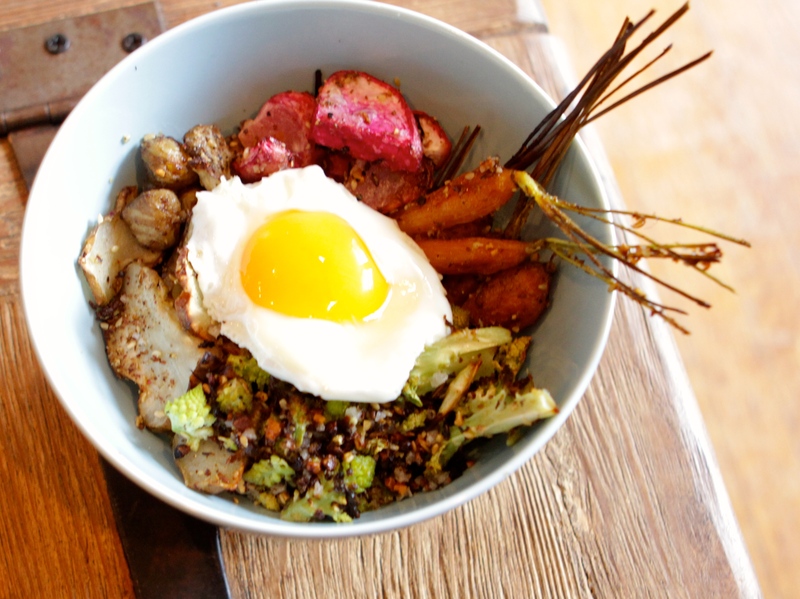 You want the brine (salty liquid) to completely cover all of the vegetables. Use the reserved cabbage leaves to completely cover the vegetables, taking up any additional space in the jar. Pack them down tightly and secure with a stone or weight if needed. Close the lid of the mason jar and leave at room temperature for about 2 weeks. Taste for sourness, and leave out on the counter until desired taste is achieved, up to another week. Store in the fridge for up to a year.